Many pages of scholarship have been devoted to the origins of the twelve-tone technique, and whether Arnold Schoenberg can genuinely be considered the originator of the method. Groups of pitches which could be considered akin to twelve-tone rows have been located in various pre-twentieth century music, the most obvious example being the opening of Franz Liszt’s Faust Symphony. But this does not amount to the employment of a technique akin to that of Schoenberg. Since the pioneering research of Detlev Gojowy, it has been established for some time that a series of Russian composers arrived at their own use of twelve-tone complexes prior to Schoenberg. These would include the complexes found in Skryabin’s fragment Acte Préalable (1912), the second of Arthur Lourié’s Deux poemes, op. 8 (1912), the first of Nikolai Roslavets’ Two Compositions (1915), various works of Nicolas Obouhow from 1915 onwards such as Prières (1915) , and Ivan Vyschnegradsky in his La journee de l’existence (1916-17)  . These composers generally worked with post-Scriabinesque complexes which were expanded to include all twelve tones of the chromatic scale , quite distinct from the technique which Schoenberg would develop in the 1920s , and their work remained generally obscure and little-known outside of Russia at this point. Roslavets remained living in the Soviet Union after 1917, whilst Obouhow moved to Paris in 1918, and Lourié moved there in 1924 . Alban Berg had used a harmony featuring all twelve chromatic pitches at the beginning of the third of his Altenberg-Lieder, op. 4 (1912),‘Über die Grenzen des All..’, op. 4, no. 3, then a twelve-note series in no. 5, ‘Hier ist Friede!’, as well as twelve-note themes in the Passacaglia, Act 1, Scene 4 (written before the end of 1919), and the Theme and Variations, Act 3, Scene 1, of Wozzeck (1914-22) , and Webern intuitively arrived at a way of organising the individual Sechs Bagatellen, op. 9 (1911) so that as a general rule, the piece would end after all twelve chromatic pitches had sounded, then began his ‘Gleich und Gleich’, op. 12, no. 4 with a statement of the twelve pitches with none repeated . All of these developments demonstrate the extent to which the most radical varieties of chromaticism or pan-tonality were leading towards the establishment of twelve-note complexes (as would Schoenberg in 1914 in Die Jakobsleiter), but none had yet arrived at means for using sets of twelve chromatic notes in the forms of rows to provide fundamental structuring techniques. Three composers who did do this would have a definitive influence upon the future direction of dodecaphonic composition in Germany, each of who have been considered as rival contenders for having written the first twelve-tone work : Yefim Golyshev (1897-1970), through the writings of Herbert Eimert (1897-1972), Josef Matthias Hauer (1883-1959), through the teachings of Hermann Heiß (1897-1966) and of course Arnold Schoenberg (1874-1951) through his own work and the music and teaching of numerous students. The prodigious Odessa-born Golyshev moved to Berlin in 1909, his family fleeing anti-semitic pogroms . Here he studied at the Stern’schen Konservatorium, and made the acquaintance of Busoni, who encouraged him in his musical work ; he may also have heard free atonal works of Schoenberg such as Pierrot Lunaire, which was first performed in the Berlin Choralion-Saal on October 16th, 1912 . Golyshev remained living in the city through until 1933 . In 1914 (by his own account) Golyshev composed a five-movement dodecaphonic string trio (which was published in 1925 by Robert Lienau-Verlag as Zwölftondauer-Musik ), and in the same year began a string quartet which was intended for performance at the Gesellschaft für Neue Musik in Cologne in early 1923 . A recording of this work is available here. The trio is structured around symmetrical patterns between movements as regards rhythms (so that the same figures are shared by the first and fifth, and the second and fourth), and uses twelve-note sets, which are clearly numbered in the score. In each section, all twelve notes are used, but not in a fixed order  (see below for the opening). Golyshev used a new notation to avoid conventional accidentals (distinct from that developed earlier by Busoni), by which a note with a cross inside the notehead indicates a sharp; others are natural . A recording of the complete work can be heard here. 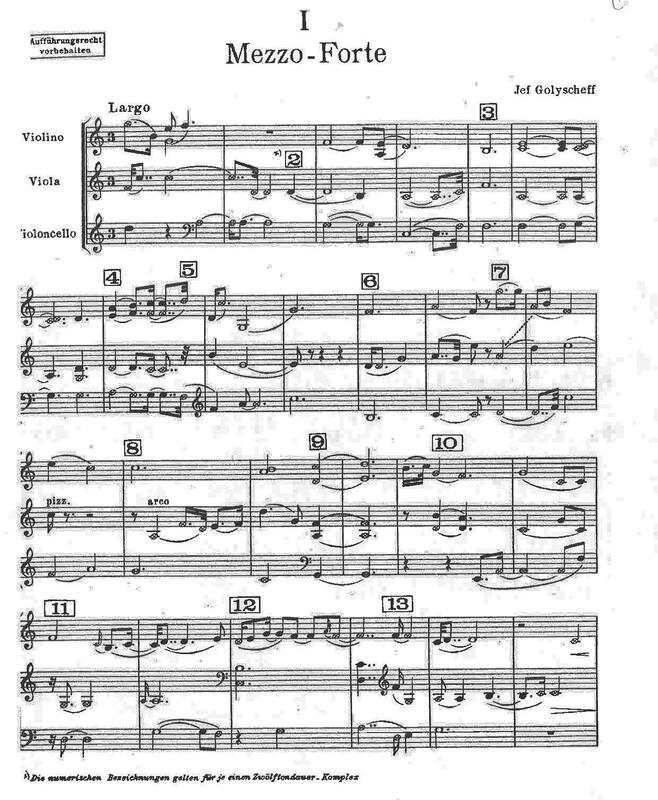 An orchestral work from 1919, Das eisige Lied, a symphonic poem lasting 75 minutes with songs, orchestral music and visual spectacle, was apparently also dodecaphonic, but is now lost . During the war years Golyshev composed more and became friendly with Busoni, Richard Strauss, and Stravinsky, as well as Walter Gropius and other artists . Golyshev’s father was a friend of Kandinsky’s, and the artist had persuaded inspired Golyshev to begin drawing prior to his move to Germany . By the time of his Sinfonie aggregate, which was given its world premiere by the Berlin Philharmonic on February 21st, 1919 , Golyshev had become involved with the Dadaists, alongside Raoul Hausmann and Richard Huelsenbeck, and co-wrote a manifesto calling for a ‘brutal battle’ against ‘expressionism and the neoclassical culture as it is represented by Der Sturm’ ; his work featured prominently in the first Dada exhibitions . He presented an Anti-Symphonie (Musikalische Kreisguillotine) as part of these exhibitions in April 1919, and went on to explore new musical instruments ; he also subsequently pursued a separate career as a chemist . He would also become a member of the Novembergruppe at some point in the early 1920s, alongside the likes of Stuckenschmidt, Hans Tiessen, Max Butting, Philipp Jarnach, Kurt Weill, Wladimir Vogel, Hanns Eisler, Felix Petryek, Jascha Horenstein, George Antheil, and Stefan Wolpe . One figure who was deeply interested in the work of Golyshev was the composer, critic and later producer at WDR, Herbert Eimert, who published his Atonale Musiklehre in 1924, which Eimert himself claimed to be the first book of its kind in German . This is a work whose highly mathematical tone, almost making a fetish of numerical patterns, differs very deeply from the presentations of Schoenberg in particular. Eimert also composed a twelve-tone string quartet for performance as part of his final examination. His conservative teacher, Franz Bölsche, was appalled by both of these, and intervened to have him expelled from the institution and the quartet removed from the programme . In the Atonale Musiklehre, Eimert adopted Golyshev’s notational device throughout, and listed an unnamed Golyshev work from 1914 as the first example of twelve-tone music, then writing that Hauer had pursued pure atonality the following year . Eimert at some point became a close friend of Golyshev, and owned several of his paintings which were destroyed during the war , but when they first met is unclear (likely before 1924), as Eimert’s memories were hazy, according to Helmut Kirchmeyer . Eimert would go on to press the case for Golyshev being the first twelve-tone composer in various later writings . Schoenberg had spent two periods prior to World War One in Berlin, 1902-03, where he had worked in the Überbrettl cabaret and also composed Pelleas, as well as scoring some operettas, and 1911-15, during which period he had written Pierrot Lunaire and also begun the Four Orchestral Songs op. 22, whilst giving some poorly attended lectures at the Stern Conservatory and hostility from the press . Could Schoenberg have met Golyshev in Berlin during this second period, or even known of Golyshev’s piece before he embarked upon his own first proper dodecaphonic composition in July 1921 at the latest? Little of detail is known of Golyshev’s time in Berlin prior to 1918, and I am unaware of any direct or indirect references to Golyshev in Schoenberg’s writings or correspondence from the time . There would have been various events which both might have attended, and they shared mutual friends and acquaintances (such as Busoni) who might have introduced them, but there is no firm evidence. Detlew Gojowy, based on the account of Golyshev’s widow, claims that Golyshev sent the Trio to Schoenberg (though no date is given), but received only a ‘ugly and discouraging’ letter back, with Schoenberg insisting that the twelve-tone technique was his own invention . This would presumably have been after the summer of 1921 (for otherwise Schoenberg would not yet have established the twelve-tone technique) and probably after 1925 (assuming Golyshev sent a copy of the printed score). Thus it looks unlikely that Schoenberg was aware of the Trio before this date, though it is conceivable that a mutual friend or acquaintance might have mentioned it to him; a subject which might warrant further research. 1. See Detlew Gojowy, ‘Frühe Zwölftonmusik in Rußland (1912-1915)’, in Beiträge zur Musikwissenschaft Jg. 32, Heft 1 (1990), pp. 17-24; Hans Oesch, ‘Schönberg und die russischen Avantgardisten um 1920’, in Bericht über den 2. Kongreß der Internationalen Schönberg-Gesellschaft. Die Wiener Schule in der Musikgeschichte des 20. Jahrhunderts, edited Rudolf Stephan and Sigrid Wiesmann (Vienna; Verlag Elisabeth Lafite, 1986), pp. 108-121; and Elena Poldiaeva, Le message de Nicolas Obouhow: Reconstruction d’une biographie, translated from Russian by Michèle Kahn (Paris: editions Van de Velde, 2011), pp. 33-42. 2. For analyses of these processes in non-dodecaphonic contexts in the music of Skryabin and Roslavets, see George Perle, Serial Composition and Atonality: An Introduction to the Music of Schoenberg, Berg and Webern, sixth edition (Berkeley & Los Angeles: University of California Press, 1991), pp. 40-45. 3. Some writers have explored similarities between the contemporary compositional developments of Scriabin and Schoenberg. See Zofja Lissa, ‘Geschichtliche Vorformen der Zwölftontechnik’, Acta Musicologica Vol. VII, Fasc. 1 (January-March 1935), pp. 15-22, as cited in Detlef Gojowy, Neue sowjetische Musik der 20er Jahre (Regensburg: Laaber-Verlag, 1980), pp. 59-61. 4. Larry Sitsky, Music of the Repressed Russian Avant-Garde, 1900-1929 (Westport, CT: Greenwood Press, 1994), pp. 88, 254. 5. Douglas Jarman, The Music of Alban Berg (Berkeley & Los Angeles: University of California Press, 1979), pp. 72-73. 6. Anton Webern, The Path to the New Music, edited Willi Reich (Bryn Mawr, PA, London, Vienna, Zürich and Mainz: Theodore Presser in association with Universal Edition, 1960), pp. 51-52. 7. Back in 1955, Oliver Neighbour articulated this view. See Neighbour, ‘The Evolution of Twelve-Note Music’, Proceedings of the Royal Musical Association, 81st Sess. (1954-55), pp. 49-61. 8. Peter Deane Roberts, ‘Efim Golyschev (1897-1970)’, in Larry Sitsky (ed), Music of the Twentieth-Century Avant-Garde: A Biocritical Sourcebook (Westport, CT: Greenwood Press, 2002), p. 173. 9. Ibid. p. 173. Gojowy, Neue sowjetische Musik, p. 103. 10. Hans Heinz Stuckenschmidt, Schoenberg: His Life, World and Work, translated Humphrey Searle (London: John Calder, 1977), p. 204. 11. Eberhard Steneberg, Arbeitsrat für Kunst: Berlin 1918-1921 (Düsseldorf: Edition Marzona, 1987), p. 134. 12. See Robert Lienau Musikverlage Magazin Archiv, Ausgabe Nr. 4 (2002), at http://www.zimmermann-frankfurt.de/cgi-bin/main.pl?action=mgz_arc&ausg=2002/4 . 13. Schlösser, Arbeitsrat für Kunst, p. 134. The performance was cancelled because of the technical difficulties involved. See Herbert Eimert, ‘Zum Kapitel „Atonale Musik“’, Die Musik, Vol 16, No. 12 (September 1924), p. 902. The source for the date when this work was begun comes from Golyshev’s widow, according to Detlef Gojowy (Neue sowjetische Musik, p. 103 n. 362a), though the fifth movement was apparently dated 1925. Gojowy points out that the possibility should not be excluded that the quartet and trio were confused by some writers, and may be just a single work. 14. Roberts, ‘Golyschev’, pp. 174-175. Roberts also notes that Golyshev allows static repetition of a note, passing a note from one instrument to another, and doubling at the octave or unison. 15. This technique was also pioneered by Obouhow soon afterwards, though it is not clear whether either composer was aware of the other’s activities (see Larry Sitsky, Music of the Repressed Russian Avant-Garde, 1900-1929 (Westport, CT: Greenwood Press, 1994), pp. 254-255). 16. Neighbour, ‘The Evolution of Twelve-Note Music’, p. 49; Joan Ockman, ‘Reinventing Jefim Golyscheff: Lives of a Minor Modernist’, Assemblage, No. 11 (April 1990), p. 73. 17. Schlösser, Arbeitsrat für Kunst, p. 134. 18. Joan Weinstein, The End of Expressionism: Art and the November Revolution in Germany 1918-1919 (Chicago: University of Chicago Press, 1990), p. 75. There is no mention of Golyshev, however, in Arnold Schoenberg and Wassily Kandinsky, Letters, Pictures and Documents, edited Jelena Hahl-Koch, translated John C. Crawford (London & Boston: Faber & Faber, 1984), nor in the various essays in Konrad Boehmer (ed), Schönberg and Kandinsky: A Historic Encounter (New York & London: Routledge, 1997), nor Schönberg-Kandinsky. Blauer Reiter und die Russische Avantgarde. Sonderausstellung 9. März – 28. Mai 2000, Journal of the Arnold Schönberg Center, 1/2000. 19. Peter Muck, Einhundert Jahre Berliner Philharmonisches Orchester, Erster Band: 1882-1922 (Tutzing; Hans Schneider, 1982), Band III, p. 180. 20. Raoul Hausmann, Richard Huelsenbeck and Jefim Golyscheff, ‘Was ist der Dada und was will er in Deutschland’, Der Dada 1, No. 1 (June 1919), cited in Weinstein, The End of Expressionism, p. 234. 21. Weinstein, The End of Expressionism, pp. 234-236. 22. Gojowy, Neue sowjetische Musik, p. 103. For more on the Antisymphonie, see Raoul Hausmann, ‘Jefim Golyscheff’, in Heinz-Klaus Metzger and Rainer Riehn (eds), Musik-Konzepte 32/33: Aleksandr Skrjabin und die Skrjabinisten (Munich: edition text + kritik, 1983), pp. 174-177. 23. See Golyscheff: Ausstellung der Galleria Schwarz (Milan: Galleria Schwarz, 1970), pp. 1-4. 25. Herbert Eimert, Atonale Musiklehre (Leipzig: Breitkopf & Härtel, 1924). 26. Charles Wilson, ‘Herbert Eimert’, at Grove Online (accessed 2/9/14). Wilson argues the case that the Atonale Musiklehre anticipates the work of later theorists such as Babbitt. Eimert managed with his pronouncements on this work to annoy Josef Matthias Hauer, who claimed prior rights over the technique, and who wrote an open letter to Die Musik about the matter. See Helmut Kirchmeyer, Kleine Monographie über Herbert Eimert (Stuttgart & Leipzig: S. Hizel Verlag, 1998), pp. 4, 16 n. 13-14. Hauer’s open letter, dated September 5, 1924 was published in Die Musik XVII/2 (November 1924), pp. 157 a/b, in response to Eimert’s article ‘Zum Kapitel: “Atonale Musik”’, in Die Musik XVI/12 (September 1924), pp. 899-904. Eimert replied with an open letter of his own, dated January 1025, which was published in Die Musik, XVII/6 (March 1925), pp. 478 a/b. 27. At least this is how it was portrayed by Eimert himself, in an autobiographical sketch for his own 65th birthday, broadcast on Monday April 9th, 1962. Apparently all the Musikhochschule records from that time are lost; Kirchmeyer laments that at the time of his writing, the proper history of the institution has not been written, and it would be difficult due to the fact that many municipal documents were destroyed in the war, though also suggests that the very fact that so many major figures at the Hochschule at the time were involved with the Nazis was a disincentive for the subject to be studied right after the war. See Kirchmeyer, Kleine Monographie, p. 17 n. 16. 28. Eimert, Atonale Musiklehre, p. 31. Eimert named the string quartet of Golyshev as the first twelve-tone work in ‘Zum Kapitel „Atonale Musik“’, p. 92. 29. Walter Zanini, ‘Jeff Golyscheff e as Dificuldades de sua Recuperação’, Revista Música, Vol. 3, No. 1 (May 5-16, 1992), pp. 7-8. 30. Kirchmeyer, Kleine Monographie, p. 20, n. 31. 31. See Eimert, Lehrbuch der Zwölftontechnik (Wiesbaden: Breitkopf & Härtel, 1954), pp. 57-58 and Grundlagen der musikalischen Reihentechnik (Vienna: Universal Edition, 1964) , pp. 161-162. Eimert also expressed this historical view in an edition of the Musikalische Nachtprogramm for WDR, entitled ‘Unbekannte Anfänge der Zwölftonmusik’ on October 4th, 1962. See Hans Oesch, ‘Pioniere der Zwölftontechnik’, in Baseler Studien zur Musikgeschichte Band 1 (Bern: Francke Verlag, 1975), p. 274, n. 3. 32. O.W. Neighbour, ‘Arnold Schoenberg’, at Grove Online (accessed 2/9/14). 33. A thorough account of Schoenberg’s second period in Berlin can be found in Stuckenschmidt, Schoenberg: His Life, World and Work, pp. 145-194. 34. Gojowy, ‘Frühe Zwölftonmusik in Rußland’, pp. 22-23.